My favorite Christmas memory...what's yours? But I remember waking up before dawn and seeing that Santa had been there. So I ran to the window, as if he'd just left and I might still catch a glimpse, and on the pristine moonlit snow outside I could distinctly see a double track through the snow, perfectly parallel, exactly like what a sleigh (or a sled) would leave. I also remember sitting cross-legged on the floor by the lighted tree stringing popcorn with needle and thread to make garland for the tree. And popcorn balls, you know the real ones, with molasses. And snow cream on those rare occasions we got more than an inch or two of snow. Lying on my back under the tree, looking up through the green branches at the glistening ornaments and colorful lights. And gifts! Chatty Cathy, Mrs. Beasley, Tonka, Etch-A-Sketch, pick-up-sticks, jacks, Mr. Potato Head, Cootie, Mystery Date! So many nice memories from childhood... What are your favorite childhood Christmas memories? I'm a Baby Boomer. And I remember the hot pants craze very well. We all wore them. The shorter the better. Of course we were much younger then. I'd feel absolutely naked (and.. er.. embarrassed) wearing them now. So imagine my surprise when I was given the chance to try out a pair of... HotPants! No, these aren't the shorty-shorts of decades ago (has it really been that long??). These HotPants are exercise shorts that are supposed to help you drop two jeans sizes in about 2 weeks. Oh yeah. I'm so in. If you're a regular blog reader, I bet you've already seen several reviews of HotPants. I have been reading the other reviewers' reports to see if their experiences paralleled mine, and they pretty much did. The thing is, when a product review blogger is sent a product to review, it is expected that the item will be used fairly immediately and written about as soon as possible. But when a product like this requires constant use for two weeks up to two months to see any noticeable effects, that's kind of hard to do. So I can't really say whether HotPants work as advertised or not, because I haven't been using them long enough. Their website has all kinds of testimonials from women from all walks of life who swear by HotPants. I'll have to take their word for it, at least for now. In another month or two, maybe I'll have some spectacular results of my own to share! But I can at least tell you about this product, can't I? After all, the holiday season is nearly upon us and that means parties and get-togethers, and that means fancy clothes that we probably haven't worn since last year. Ahhh... and what if those clothes no longer fit? Do I really have time to rush out and shop for a new little black dress, with the chaos of consumer Christmas shopping in full swing? Not me. I'm betting that by Christmas, if I've used my new HotPants faithfully until then, I'll still be able to slip comfortably into anything in my closet, with room to spare for all the inevitable goodies I know will be tempting me whichever way I turn! HotPants are definitely not as short as the old hot pants. They are more like Bermuda shorts. Mine come to just above my knee, and hit right at my waist. They are made of a soft neoprene-like material, kinda like a scuba wetsuit, that stretches to fit. But there's more. HotPants are specially engineered using Celu-Lite technology, which reflects back the heat naturally generated by the body to promote deeper warming of tissues, leading to higher levels of perspiration and therefore breaking down fat and toxins that contribute to the appearance of cellulite. 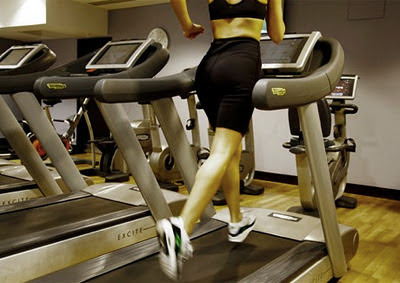 This is the same principle used in spas to reduce the appearance of cellulite. But you can do this in the comfort - and privacy - of your own home. HotPants are most effective when used while exercising and working out, but can be worn any time, while doing housework or running errands, or even while sleeping. Hmm... waking up to reduced cellulite? That sounds good to me! Like I said, I haven't used them long enough to see real results, but they definitely increase warmth and sweating and blood flow. My tummy feels more controlled and flatter, and my "Thunder Thighs" look much sleeker while wearing them. So I am optimistic about results. HotPants are all the rage in Europe, and now they are available in the USA too. If you've got a lot of parties planned for the holidays and want to look your best, you've still got time to grab a pair and use them for two or three weeks and see what kind of results you get. You've whittled down your gift buying list to a manageable size, and you know exactly what you're going to get for the people left on the list. Maybe she's a co-worker whom you don't know all that well, so it's hard to "personalize" a gift. Maybe she's a mother-in-law who is hard to please (no offense to mothers-in-law!). Maybe she's a wealthy relative who already has everything -- and I mean everything. No matter who she is, chances are she pumps her own gas. Take a look around next time you're out driving. How many full-service stations are there anymore? Not many. Most gas stations are self-service now. We all know what it's like to pump gas in cold weather. The metal of the nozzle can be ice-cold! Not to mention standing there in freezing temperatures while pumping gas. A recent new law eliminated the little "auto-flow" latch bar that would allow you to keep the pump going while you let go of the handle. Which means that you must keep your hand on it to pump your gas into your vehicle. Ever think about the millions of germs on those handles? Me either, until I heard about a great new product called Pump Gloves designed specifically for women who pump their own gas. Pump Pure, Pretty and Protected. Pump Gloves are designed to be used not only for pumping gas but doing other things around your car, like a self-service car wash or drive-up ATM for instance. They come in their own zip-lock bag which stores easily in your car's glove compartment. You put them on to pump gas and you take them off and put them away in their own bag when finished. Your hands never touch the pump handle. And they are thin enough for pressing any electronic buttons you need to press on the pump itself (unlike heavy winter gloves which usually must be removed for that!). Bottom line? Pump Gloves make the perfect gift for any woman on your gift list, but especially for those who seem to have everything and are hard to find gifts for. I bet they don't have a pair of Pump Gloves in their glove box! 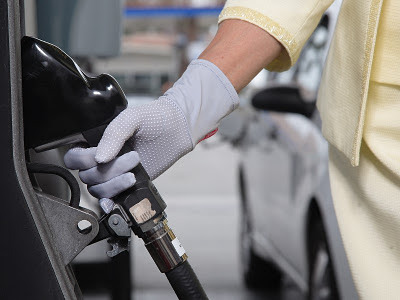 Pump Gloves add Comfort, Class and Style to Pumping Gas. Available in Classic Black or Light Gray, the gloves are machine washable and one size fits all. And at only $14.95 pair, they are also affordable for everyone on your gift list. I'm always on the lookout for great new products that fulfill a need, and Pump Gloves fit that description perfectly! 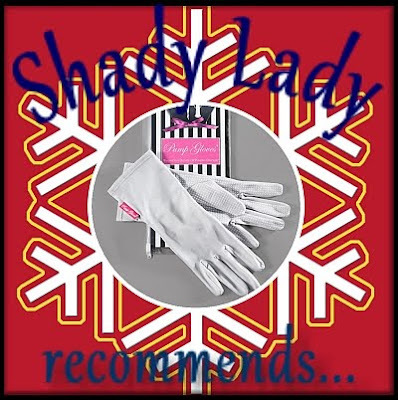 Shady Lady recommends Pump Gloves for any woman on your gift list! I love popcorn. No, seriously, I LOVE popcorn! I eat it at least twice a week. And nobody makes microwave popcorn like Orville Redenbacher! So I was excited to hear about some new varieties soon to hit stores. My favorite is of course extra butter (yum!!) but now and then I'll grab a bag of pre-popped cheese popcorn or white cheddar popcorn. My second favorite popcorn aside from Orville Redenbacher! Well, guess what? Okay, I won't keep you guessing... the news is that Orville Redenbacher's new varieties are going to be White Cheddar, Extra Cheese, and Sea Salt & Vinegar. I couldn't wait to toss my sample of White Cheddar in the microwave and check out the wonderful new flavor. It popped up just perfectly - there wasn't one single unpopped kernel - how unusual is that?! - and I didn't even notice a lot of husks. Orville Redenbacher is simply the ultimate in microwave popcorn! The popcorn was plain, no added flavor or salt or anything. The white cheddar topping came in a separate little package, so you can add as much or as little as you like. And it was too much. The white cheddar clings to the plain popcorn very nicely and really isn't as messy as most bagged cheese popcorns. But using the whole package made the popcorn too salty for my taste. And I love salt. So if I say it was too salty, it was definitely too salty. You will want to experiment to find the right amount for you and your family, and DON'T add any extra salt. You won't need it, I promise. In fact, that one little packet of white cheddar was so intense with flavor (and salt) that I could have used half of it, and saved the other half for another serving of plain popcorn later. So if you pick up a box of Orville Redenbacher White Cheddar, you might also want to grab a box of Orville Redenbacher plain microwave popcorn as well, so that you can get DOUBLE the amount of white cheddar popcorn! I don't know if this holds true for the Extra Cheese or the Sea Salt & Vinegar varieties (since I didn't get to sample them) but my guess is that it does. You'll just have to try them for yourself. I can't wait until they hit my grocery shelves! Ah, nuts! I love 'em. All kinds. I've never met a nut I didn't love. And I choose nuts over most other things. Mints or nuts? Nuts, every time. Fudge with nuts or without? With, definitely. Brownies without nuts? Okay (hey, it's chocolate after all) but very much preferred with nuts. What would a pecan pie be without pecans? Nuts are one of life's most delicious little pleasures. I can remember Christmas as a kid and one of the brightest joys was mixed nuts, something we didn't enjoy all year long but was reserved for special occasions and holidays. 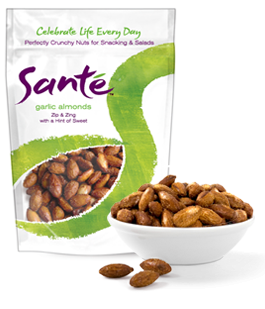 Santé Nuts has brought back all the special pleasure of snack nuts with their line of healthy, crunchy, and very satisfying products. When I opened the box of samples I was sent, I knew right away these were no garden variety nuts! I have a darling eighty-something-year-old neighbor who brings me homemade fudge every time she makes it. Her fudge is absolutely mouth-watering... but made without nuts. Because of her particular health problems, she can't eat nuts, so she doesn't use them in cooking. No problem. I figured this was the perfect time to try the Santé nuts I had been sent for review. So I opened the package of Santé roasted salted pecans and popped a couple into my mouth along with a bite of fudge. I love nuts of all kinds, but I especially love them roasted/toasted. Brings out the natural flavor more intensely, in my opinion. And Santé has learned how to roast/toast nuts to perfection. These are without doubt the crunchiest, freshest tasting nuts from a package that I've ever eaten. And for a nut lover like me, that's saying something! So I eagerly tried the other nut samples Santé had sent. Candied pecans or candied walnuts, anyone? Oh, too bad, the packages are empty now because I ate them all!! YUMMY!!! Perfectly roasted and flavored to bring out the crunchy goodness. I can't even bring myself to think these would be good in recipes (although they would be awesome) ... they're absolutely da bomb for simple snacking! So I opened the final sample package which was garlic almonds. Described on the pack as "zip & zing with a hint of sweet", yes, these would be ideal for salads, but they have way too much "zip & zing" for mere snacking! Don't get me wrong, I love garlic and spicy foods, but I love almonds toasted just as they are, and in this case too much of a good thing was... well, too much. I'd definitely use them in a Waldorf or Caesar salad, chopped into more useable sized pieces (they come whole) or in a recipe such as Tangy Almond Garlic String Beans (doesn't that sound yummy!). But as a snack they didn't compare to the three other samples I received. To each his own... you may love them right out of the bag! 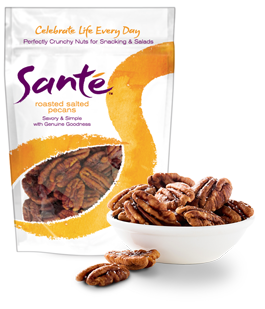 Santé Nuts are a healthy snack because they use only the highest quality nuts, all-natural ingredients, and very little oil. Sara Tidhar, the founder and genius behind Santé Nuts, learned the secret roasting technique from her grandmother and had been making these same healthy nut snacks for her children until starting up the Santé Nuts business. And am I ever glad she did! These are hands down the most delicious, crunchy nuts I've ever eaten. I wish these artisanal nuts were available where I usually shop, because I'd load up on them every time. But you can buy them online and have them delivered to your home. And now through December 16th, you can get 25% off your online order by using discount code 2011-Blog-020. A votre santé! To your health! One nice thing about being single and living alone? I can eat meals or snacks anytime I like. Anywhere I like. And I like eating while working at the computer. I have no problem multitasking that way! But I do have a problem with smears and splashes. No matter how careful you are, you're going to get something on your keyboard and/or computer screen. It's inevitable. I also wear computer reading glasses (which I recently reviewed for Reading Glasses Shopper Online). They too get splashed and smeared with normal use. Keeping everything clean and clear used to be a chore, and I was always afraid that whatever product I used might actually do more damage than good! 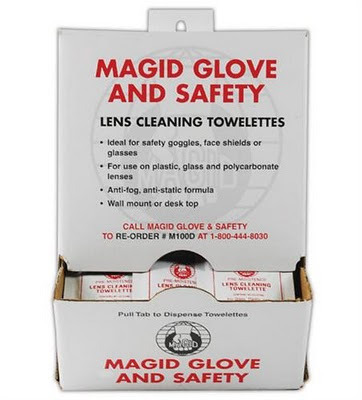 That, at least, is no longer a problem since I found Magid Lens Cleaning Towelettes. The Magid Glove & Safety Manufacturing Company is America's leading manufacturer, importer, distributor and direct supplier of hand protection, protective clothing, first aid, and personal protective equipment. 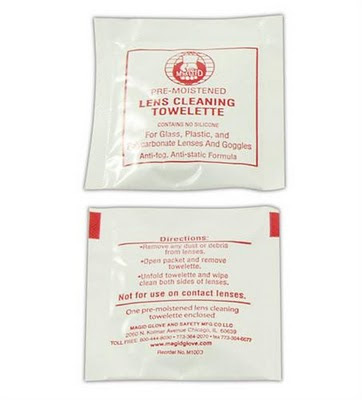 I love their Lens Cleaning Towelettes! They come individually wrapped like those finger wet-nap thingies, 100 to a box. They are pre-moistened, anti-fog, anti-static, and can be used on glass, plastic or polycarbonate eyeglass lenses, safety goggles, and computer screens. When I cleaned my computer reading glasses with one of the towelettes, I couldn't believe how crystal-clear they were after cleaning! And since the lenses are plastic, I was a little leery of using this new product on them, but I need not have worried. The towelette cleaned the glasses beautifully and left not a single streak or scratch behind. Next I used one on my computer screen and was very satisfied with the results. The screen is completely clean and clear, no more smudges or splashes. I will definitely be keeping some of these individually packaged pre-moistened towelettes handy for cleaning both my computer reading glasses and my computer monitor screen. And at a price of only $7.88 for a box of 100, this is a great deal. The shipping is a little high for ordering just one box for average consumer home use, but this is definitely a product you want to get your hands on, so be creative... How about combining orders with friends and relatives? A computer club? Sports club? Or maybe your employer could use these at work and would let you purchase a box at cost? 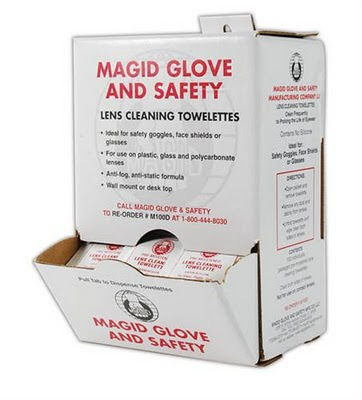 I can highly recommend the Magid Lens Cleaning Towelettes. They come in a sturdy convenient box with a handy hanger for hanging on the wall wherever a lens cleaner would be helpful. We've all heard it over and over... eat less red meat. But that's kinda hard to do when you grab a burger on the run or want to present that perfect pot roast dinner. So unless you are a vegetarian, the only solution is to cut back on the amount of meat you eat. Even one or two meatless meals a week is better than nothing. Harmony Valley Vegetarian Mixes make it easy to go meatless and still have great hamburger texture and flavor. Harmony Valley Vegetarian Mix for hamburger consists of wheat gluten and soy flour. Spices are added to enhance the flavor. Each package makes 1 lb. of "meatless hamburger" that is low in calories, fat, and carbohydrates but high in fiber, protein, and iron. And it's so simple to use! Just mix one package with 1 1/4 cups cold water, then let it stand at least 15 minutes in the refrigerator. That's all there is to it. Harmony Valley Vegetarian Hamburger Mix is ideal as a meat substitute for so many recipes, but I wanted to try it as a substitute for plain ol' hamburger meat in a pasta dish. So I fried the vegetarian mix just like I would hamburger meat, but since there is no "fat" in the Harmony Valley mix, I added about a tablespoon of olive oil to the skillet so it wouldn't stick to the pan. I cooked it on medium heat and even with the olive oil I still had to stir constantly to keep it from sticking and burning. But in the end it cooked and crumbled nicely, just like you want hamburger to do. I added it to some cooked 8-whole-grain pasta shells and pasta sauce sprinkled with grated Romano cheese. Except for some sea salt I added to the boiling water for the pasta, I added NO SALT or other seasonings. So how did it taste? Well... I can honestly say that even though I knew it wasn't hamburger, it could easily have fooled anyone for texture and appearance. As for taste, it tasted a bit like "vegetables"... I can't really describe it except to say that it doesn't taste like "meat" at all, but it's a pleasant taste overall and the seasonings are spot on. With the 8-whole-grain pasta, it was definitely a hearty dish! If you find that you just can't give up meat completely, you can always mix some Harmony Valley Vegetarian Hamburger Mix with your ground beef to stretch it and make it overall healthier. In soups, casseroles, and pasta dishes, I don't think anyone would be the wiser. I was sent one package of the Vegetarian Hamburger Mix to try, and I love pasta dishes, so I wanted to see how it does as "ground beef". But I do believe that it would probably work better as grilled patties or meatloaf. It does have a nice sticky consistency that won't easily fall apart, but frying it up in the pan like ground beef can be a bit tricky. For one thing, the color didn't change (or maybe only slightly) so it was difficult to tell if it was "done" or not. And with no fat, it does tend to stick to the pan. So the bottom line is that I honestly don't know if I can recommend this as a "ground beef" substitute if you're using it in recipes where it needs to be fried like hamburger. But if you're just looking for an alternative meat substitute for a few meals a week, you can't go wrong with Harmony Valley Vegetarian Mixes. They also make a Vegetarian Sausage Style Mix for breakfast! I love sausage, so I'd really like to try that. Sounds like it would be a great alternative for pizza too! Harmony Valley may not be available in your area yet, but you can order it online. And there's a locator on their website that will help you find it locally. Bottom line: Yes, I would heartily recommend Harmony Valley Vegetarian Mixes as a viable alternative to meat. America the Beautiful! No matter where you live in this great country, there are sure to be a number of attractions close by that would make for spectacular family getaways. Treating your family to a great getaway doesn't have to be expensive. You don't have to shell out for airline flights to visit outside your backyard. Stick an imaginary pin in your hometown on a map, then expand outward in a circle, like ripples on a pond. Depending on how far you are willing to drive, you will be amazed at the number of attractions and sights to see within the radius you just defined. When I did this, I found some great places for exciting family getaways within driving distance! The one that intrigues me the most is Hannibal, Missouri - home of Samuel Langhorne Clemens, aka Mark Twain, since the age of four when his family moved to Hannibal from Florida, Missouri, about thirty miles to the southwest. Using Memphis as my starting point, you can see from this map (courtesy of mapquest.com) that the trip is very doable for a family getaway. Hannibal is approx. 386 miles from Memphis and would take about six hours to drive. That's not allowing for all the stops in between when you find something along the way that sparks your interest! Hannibal fascinates me not only for the history but for the attractions it offers to everyone of any age. Children and grandparents alike will find something to do in Hannibal. And it is small enough to maintain that small town America feeling of warmth and hospitality. Aside from Mark Twain's boyhood home - and the house across from it where his childhood friend Laura Hawkins inspired "Becky Thatcher" - the most fascinating stop on a tour of Hannibal has to be the Museum Gallery. With scenes and exhibits from most of Twain's books and events from his life, there's definitely something for everyone here! From Tom Sawyer, visitors can "whitewash" the fence, see Tom's schoolhouse, meet Injun Joe, and get lost in the cave as Tom and Becky's candle goes out. From The Adventures of Huckleberry Finn, visitors can step onto a raft tied at the river bank and watch a film clip of Huck and Jim on the raft. From Roughing It, visitors can climb into a stagecoach and share the mining experiences of Sam Clemens and the characters, both human and animal, that he brings to life. From A Connecticut Yankee in King Arthur's Court, visitors travel back in time as the Yankee saves himself from burning at the stake by predicting a solar eclipse, test the "modern" inventions that he brings to the Knights of the Round Table, and view the social injustices and political inequities of the time through original pen and ink illustrations by Dan Beard, founder of the Boy Scouts. Sam Clemens was a riverboat pilot from 1857 to 1861. Celebrating this portion of his life, there's a replica of a steamboat pilot house where visitors can view the great river that had such an influence on Clemens and his later writings, grasp the pilot wheel and tug the steamboat whistle or engine room bells. You can almost hear the call Mark Twain! The Norman Rockwell Gallery is a special treat for visitors. In 1935, Norman Rockwell was commissioned by Heritage Press to illustrate special editions of Tom Sawyer and Huckleberry Finn. Rockwell donated the 15 original paintings to the museum and they are on permanent display here. The special editions of Tom Sawyer and Huck Finn illustrated by Norman Rockwell are only available for purchase in the museum gift shops. The Museum regularly hosts writers', young authors', and teachers' workshops, as well as art exhibits. For a leisurely way to spend an afternoon or evening, try the Mark Twain Riverboat. You can enjoy one-hour sightseeing cruises, two-hour dinner cruises, and two-hour jazz/blues cruises. The whole family can enjoy the sightseeing tours and dinner cruises, but the jazz cruises have a cash bar and are for adults. Perfect way to end a day in Hannibal! Want to catch some theater? There are several in Hannibal, each with a distinct flavor for discriminating palates. 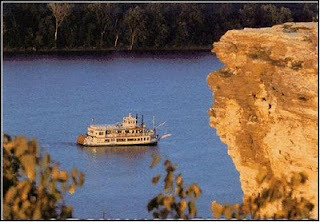 Tour Hannibal's Historic District aboard the Mark Twain Clopper, a horse-drawn carriage perfect for relaxed sightseeing. Or try the Hannibal Trolley for a different sightseeing experience. 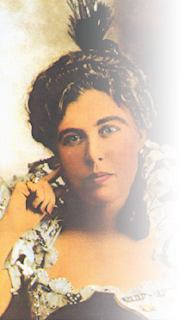 Another famous resident of Hannibal was "Unsinkable" Molly Brown. She was supposedly on her way to Hannibal when the Titanic went down. There's a museum at her birthplace that is worth the visit for the history alone. Then there's the Big River Train Town Museum, the Tom Sawyer Diorama, the Mark Twain Memorial Lighthouse, and so much more. 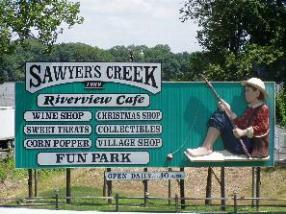 And when the kids get cranky after so much "culture", you can indulge them with a visit to Sawyer's Creek, a large complex with a Fun Park complete with miniature golf, bumper boats, arcade, bounce house, and "tootoo twain" among its attractions. There's a sweet shop, wine shop, gift and Christmas shop for all your retail therapy needs. The Riverview Cafe offers delicious dishes with a great view of the Mississippi River. Hannibal, Missouri offers a great family getaway in America's Heartland that is accessible by car within a day's drive of just about anyone. When thinking about your next family getaway, at least put Hannibal on your list of possibilities. There is tons of information online, plus you can request an information packet through the mail. Have you found any family getaway spots within driving distance that you'd like to share? I'd love to hear about them! But one of my new year resolutions is to try to eat better, and that doesn't just mean losing weight through proper nutrition and diet, but it also means being good to myself. I firmly believe that I overindulge in "comfort food" because my taste buds aren't being challenged and satisfied. So the dishes I truly love (mashed potatoes and gravy anyone?) I turn to again and again because they are familiar and beloved. Time to step out of that...ahem...comfort zone. If I had a better understanding and knowledge of "what goes with what", I would become not just a better hostess but also more contented on a personal level. So when I heard about this new phone app called "Pair Savvy", it was with a great deal of expectation and excitement that I tried it out. Pair Savvy couldn't be easier to use. Take a look at this Web mock-up of the actual app for your phone. You'll instantly see just how simple and useful this is. As you can see, you can search by cheese, by wine, or by beer. Or you can click "Surprise Pairing" for a...surprise pairing. :) You can even save favorite pairings in "My Pairings" for easy look-up later. In an instant, I find out that Swiss is best paired with Champagne or Riesling wine, as well as appropriate beers and fruits. Champagne and Swiss? I'll definitely have to try that combination! I love Beaujolais wine too, so when I do a search by wine, I get suggestions for pairings that are best for Beaujolais. Well, as you can see, the concept and execution of this little phone app are just brilliant. No more searching gourmet websites or trying to decide if you trust the salesclerk's recommendations. Just refer to Pair Savvy anytime you need help and it's like having your own personal gourmand and connoisseur on speed dial. Get the app for your phone here! Disclosure: I am a member of One2One Network. By posting this, I am entered to win one of five gift cards. No other consideration is implied. My opinions are my own.